Springtime is a special time any place – however it is even more extraordinary in Holland. The exquisitely manicured tulip fields are truly a remarkable sight. 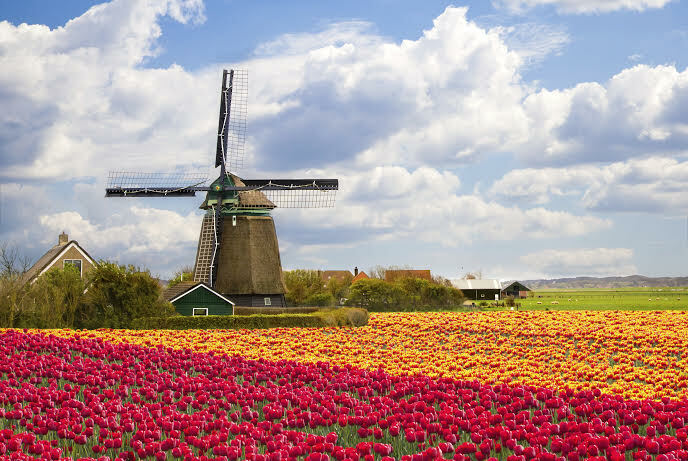 After visiting the fast-paced city of Amsterdam, slow down and discover the countryside, where blooming tulip fields, wooden shoes, and iconic windmills rule the land. The tulip originates as a wildflower in Central Asia and was first cultivated by the Ottoman Empire (now Turkey) around 1000 AD. A biologist from Vienna, Carolus Clusius, introduced the tulip to the Netherlands and Western Europe in the 17thcentury when he received several bulbs from a friend in Constantinople while employed as medicinal plant researcher at the University of Leiden. He named the flower ‘tulip’ which is the Turkish word for ‘turban’. Tulips were expensive flowers, and symbols of high status for those who could afford to purchase them. Some varieties of tulips cost even more than a house at that time! Tulip trading was a very lucrative business during ‘Tulip Mania’ until the rarity of the flower drastically decreased as supply surged above demand, causing the financial downfall of many tulip traders. To learn more about interesting history of tulips in Holland, head to the Jordaan neighborhood and visit the Amsterdam Tulip Museum. 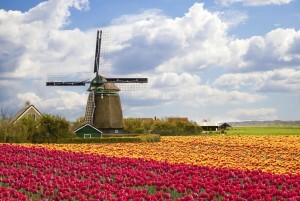 The Tulip Festival occurs in the Noordoostpolder from late April to early May each year. There are many ways to enjoy the festival, including hiking, biking, covered wagon tours, and horse carriage rides. You can even stay overnight at a campsite or farm-stay if you want a longer visit! You can participate in several different activities as well, such as photography competitions. If you are in Holland for the Tulip Festival, you should definitely pay a visit to the largest flower park in the world, Keukenhof. The park is only open every annual season for 8 weeks. Over 7 million bulbs are planted here each year, including daffodils, hyacinths, roses, orchids, carnations, lilies, irises, tulips (of course! ), as well as many other flower varieties. The combination of vibrant colors and sweet perfume of a garden of this proportion makes for a very lovely way to spend a spring day in the Netherlands! Interested in more flower festivals in Europe? Check out the Flower Carpets in Brussels! This entry was posted on Thursday, March 27th, 2014	at 12:52 pm	. You can follow any responses to this entry through the RSS 2.0	feed. Both comments and pings are currently closed.